My name is Logan Cooper and I’m the location manager for the television show From Dusk till Dawn, produced by Robert Rodriguez and filmed here in central Texas. 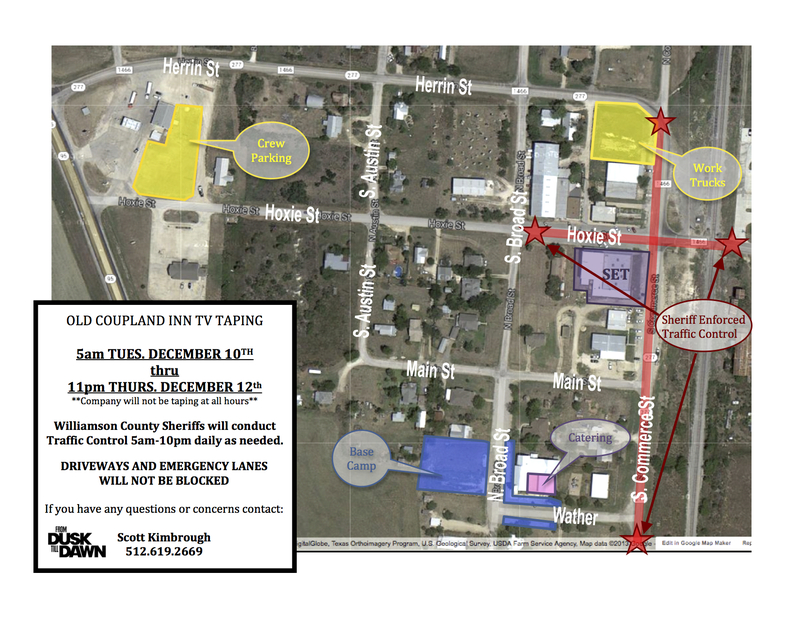 Next Tuesday-Thursday (12/10-12/12) our crew will be doing some taping in and around the Old Coupland Dance Hall. We are working with TxDot, the Williamson County Sheriff’s office, Commissioner Ron Morrison, as well as local residents and businesses. I am attaching a diagram for your review that will give you a sense of where our equipment will be located and the general scope of our impact. This entry was posted in Entertainment, What's New?, WHO is That? and tagged Dusk till Dawn, Old Coupland Inn & Dancehall on December 9, 2013 by Stewart Dale Spencer.